Whiter-Than-Snow-Appliances: Offering Repairs, Refurbished and Parts. Before Buying New, Call WTSA Today! We Also Sell Refurbished Major Appliances & Sell Parts (both new & used). WTSA Offers Name Brands, such as: LG, Whirlpool, Kenmore, Maytag, G.E., Frigidaire & KitchenAid. We also sell Rachael's Forever Friend which is a children's book that helps people cope with the death of loved ones. WTSA's *customer base has steadily grown because of our integration of Biblical principles in the conducting of our business. Somewhat like Smith Barney's motto from yesteryear (We make money the old fashioned way... we earn it!). At WTSA, we manage our business the old fashioned way: We provide our customers quality service and reliable products at affordable prices, yet without omitting the customers' most important expectation -integrity. Whiter Than Snow Appliances sales a variety of products, such as: refrigerators, freezers, stoves, washers, dryers, stackables. For customers in the surrounding areas of Upstate South Carolina, we offer pre-owned appliances with a warranty and (periodically) new appliances. Now, back to business... We also carry a supply of used appliance parts which can save you a bundle of money over the cost of new! also include your zip code for a shipping and handling quote, too. transaction fee of the appliance(s) total bill will be charged unless you'll be paying with either check or cash in person or C.O.D. upon delivery. 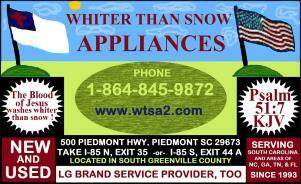 Whiter than Snow Appliances sells Warranted: New, Scratch n Dent, Reconditioned, Refurbished & Used Appliances. WTSA also services / repairs appliance in home or at our shop. ( wtsa2.com ) WTSA sells LG refrigerator appliance parts, lg parts, whirlpool icemaker, LG appliance service, LG contact department, LG warranty, stainless steel, used washer and dryer, white, dishwashers, refrigerators, tankless water heaters, electric water heater, house rent, plumbing problems, houses for rent to own, mortgages, hot water heater, dishwasher, rent to own, Washer Service, Dryer Service, Refrigerator Repairs, Freezer Repairs, used washer dryer, lg dryer parts, whiter as snow appliances, black, lg appliance stove, original, new or used whirlpool washer parts, almond, lg appliance phone number, lg appliance repair, lg sales in nc, snow appliance, frigidaire stacker dryer parts, whirlpool stove, wtsa29673, used washer, lg stove, maytag washer motor, banks, foreclosures, lg appliance factory service, Maytag buyout, are lg appliances good, serial number on lg washer, amana refrigerator solenoid valve, whirlpool purchased maytag, pickup and disposal for old appliances sc, kenmore refrigerator factory warranty, whirlpool in sc, lg warranty service news, visa & mc raising their rates, whirlpool used parts, bad lg refrigerator phone number, LG dryer solenoid, lg parts service, lg refrigerator water filter, lipodrene, lg icemaker, used kenmore washer, appliance magazine erin biesen, recommendation on lg appliances, ordering lg parts, phone number to contact LG appliance, water supply line for fridge, greenville, sc / nc, Tech Support, anderson, ge appliance dryer motors, upstate appliance anderson sc, lg products parts, kenmore dryer element, ice maker, kenmore homepage, LG red washer and dryer, icemaker valve whirlpool, Reviews, frigidaire repair greer sc, whirlpool motor, 3363394 washer pump, roper washer motor, refrigerator fan motor, washer motor used, lg front load washer, lg serial number, used parts clutch, refridgerator single water valve, lg saudia arabia, about maytag appliances, fsp appliance parts, lg usa appliances, fsp ice maker parts, lg appliance parts, washer motors, whirlpool stackable, duet washer dryer, used washer dryer, whirlpool icemaker module board, valve solenoid, clutch and clip for, lg brand parts, get paid for recycling electronics, columbia, sc, used dryer motors, whirlpool duet washer dryer, snow appliances, used washer dryer greenville sc, whirlpool washer dryer combo, kenmore, get paid for unwanted appliances, gold prices, oil prices, the dollar vs. yen, Admiral, Magic Chef, LG, Frigidaire, GE, General Electric, Jenn air, Kenmore, KitchenAid, MagicChef, Maytag, Sears, Whirlpool. Greenville, Taylors, Greer, Travelers Rest, Glassy Mtn, Dacusville, Pickens, Marietta, Easley, Central, Pendleton, Pelzer, Clemson, Possum Kingdom, Belton, Honea Path, Princeton, Sunset. Fountain Inn, Simpsonville, Mauldin, Five Forks, Reidville, Duncan, Moore, Lyman, Startex, Spartanburg, Westgate, Fairforest, Hillcrest, Chesnee. Boilings Springs, Inman, Cowpens, Gaffney, Greenwood, Seneca South Carolina, North Carolina: Gastonia, Charlotte Metro Areas, Southeast Georgia: Hartwell and Lavonia. Easley, Greer, Simpsonville, Mauldin, Fountain Inn, Pelzer, Honea Path, Belton, Northlake, Pickens, Laurens, Princeton, Spartanburg, Piedmont, Powdersville, Travelers Rest, Duncan, Moore, Marietta, Berea. WTSA sells new and used appliance parts. Call 864-845-WTSA. We can help solve your problem! You've gotta "run the race that is set before you..."
you not to waste your time by visiting his site lest his atheism and vulgar writings, laced with curse words, get into your minds, start appealling to your logic then start corrupting your soul.